Low energy lighting, less vehicle trips, special tarmac. Resurfaced and upgraded runway within extreme time limits. Real team effort to carry out all works as quickly as possible. East Midlands Airport (EMA) and engineering contractors Galliford Try delivered a UK and industry first runway refurbishment – on time and budget with zero accidents, through an innovative programme of 7 consecutive 48-hour closures. Planning and design were key to achieving success in resurfacing 150,000m2 of runway and replacing 1,200 airfield ground lights. Along with safety, security and sustainability issues. Video showing how Galliford Try and there partners delivered the East Midlands Runway scheme as a UK first in short delivery. EMA is the UK’s largest pure freight airport, operating 24 hours and handling 4.6 million passengers and 326,000 tonnes freight annually. The project was to refurbish the runway while minimising disruption to customers. The scale and logistical complexity of the project created new challenges that had never been overcome at a UK airport. A pioneering, joined up approach was adopted throughout to enable future planned growth of EMA to 10 million passengers and 1m tonnes of freight per annum while boosting local employment. Numerous challenges were faced. Specifically, handing back the construction site to an operational airport after each closure. 40 team members had to inspect 180,000m2 of runway for hazards in 45mins. There was positive media coverage with every regional news outlet, aviation and construction trade covering the refurbishment for several weeks. EMA and Galliford Try supported EMA 10k run during the closures, raising £20k for charity. New LED airfield ground lights mean 30% cost savings, energy and extended lifespan. Thousands of tonnes of old concrete and lights to be re-used in future projects. Lorry movements significantly reduced through the batching plant location and using local quarries. Onsite hotels and catering used to reduce vehicle movements. 100 tonnes of waste concrete from airport projects re-used to build roads. Compound built was used as overflow car parking and continues as car parking. 85,000 safe working hours with zero accidents. Scrupulous traffic management due to heavy plant movements every hour through single gated access. Segregated work areas to ensure no unnecessary plant and pedestrian interface. Lighting levels maintained along the 3km runway. There are significant health and safety risks associated with a project of this nature so to finish without a single incident, as well as zero defects, is a fantastic achievement. The team has every right to be very proud of what it has delivered. The runway is 150,000m2, the equivalent of 22 football pitches, which was successfully re-laid with 350 men and 2,000 vehicle movements each weekend. 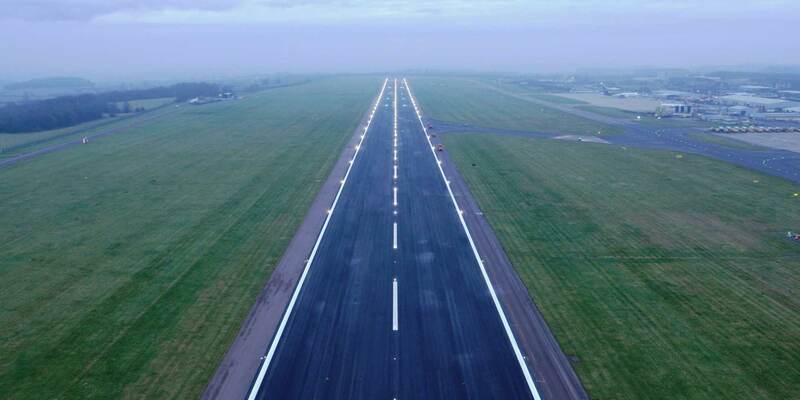 UK runways traditionally use Marshall asphalt. This used 50,000 tonnes of a new type that can be batched and laid more quickly. The project allowed successful charitable fundraising of 20k.